Learn over 1,300 Arabic words! - Yes, that's right, 1,300! And each and every one with native speaker audio. Includes flashcards and exercises. ----------------- Features and Benefits ---------------- * Over 1,300 Arabic words and phrases - Yes, that is right 1,300! * Every word includes a native speaker's audio recording. * Flashcard review and exercises to aid memorization. * Learning-list testing technique ensures word retention. * Custom WordFiles allow users to create completely custom user WordFiles. * Search for words and meaning and add to Custom wordFiles. * Upload Custom WordFiles for backup and sharing. * NEW! WordPlayer - listen to words while you exercise. 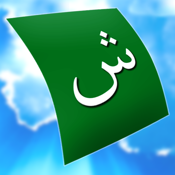 ------------------------------------------------------------ ** Now available for iPad and Mac OS X ** Arabic Audio FlashCards is a foreign language vocabulary learning tool by Declan Software. The Arabic version includes around 1,300 words and phrases each with a native speaker audio recording. Words are organized into approximately 30 WordFiles with each WordFile containing up to 50 words. The Learning List: The words are learned based on a Learning List. The Learning List contains a subset of all the words in the WordFile – 10 words by default (although this can be changed by users). The Learning List allows users to concentrate learning a small group of words at any one time. Once a word is learned (by reviewing the Learning List and completing the Exercises) it is removed from the Learning List and is replaced by another, as yet unlearned word from the WordFile. This continues until the whole WordFile is learned. Exercises: Words in the learning list should first be Reviewed using the “Review Learning List” option. Then users can move to the Exercises which include the Meaning Exercise, the Word Exercise, the Spelling Exercise and the Listening Exercise. Once all the exercises have been correctly completed, the word is marked as complete, removed from the Learning List and replaced by a new word. However, if the user gets one answer wrong in any of the exercises, then all the exercises must be completed again for that one word. This ensures comprehensive learning and retention. Managing the Learning List: After a new WordFile is loaded the Learning List size is automatically set to 10. The number of words in the Learning List can be set by adding or removing words to the Learning List in the “Review Words” feature. In the “Task” menu select “All Words in WordFile” and then return to the main page. The select “Review All WordFile Words”. As you progress through the words in the WordFile words can be added to and dropped from the Learning List using the “Add to Learning List” / “Drop from Learning List” button. Loading new WordFiles: To switch to another wordfile simply press the “Load Another WordFile” button and then select the WordFile you desire from the “Load WordFile” table. ------------------------------ Other language versions of Audio FlashCards includes on iTunes include: Brazilian Portuguese, Chinese, Chinese (Traditional), Japanese, Korean, Bahasa Indonesian, French, Italian, Spanish and Russian. And Greek and Portuguese coming soon.